"pH" is a term used by chemists to describe the acidity or basicity of a solution. 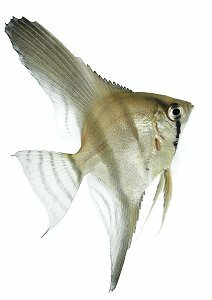 Sudden changes in pH are very stressful to fish - particularly marine fish and Discus and Angels. A measure of 7.0 is neutral: neither acid nor base. pH ranges measured below 7.0 are considered acidic. pH ranges above 7.0 are considered basic. Four terms describe the total amount of dissolved mineral content that is present in the water (the hardness): Buffering Capacity = Total Alkalinity = pH stabilizing ability = Hardness of your water. Some tropical fish such as Discus are very sensitive to water hardness and need very soft water. Marine tanks and some African Cichlid tanks usually need hard water. Monitoring the pH alone allows you to detect when a change has taken place, but it provides no information regarding the stability of the pH in the tank environment. The dissolved mineral content (alkalinity) affects the ability of your water to hold its pH values steady. as well as hydroxides of sodium and potassium. The natural progression of most aquariums is toward the acidic pH range. Organic decomposition turns your freshwater tank more acidic over time. If a tank is depleted of mineral content for any reason, the ability to keep its pH stable is compromised. In marine tanks in particular, the removal of minerals by the organisms as well as the topping off of the tank with mineral-stripped water (such as water from a reverse-osmosis filter) destabilizes the pH and causes it to fall. Raising the pH and keeping it up requires dissolved mineral content (total alkalinity/buffering capacity). Water with low levels of dissolved minerals (soft water) such as de-ionized or Reverse Osmosis water (and some naturally occurring waters) will be very hard to stabilize. The pH will continually drop. This is a huge challenge for Marine tanks and some African Cichlid tanks and requires the continual monitoring of total alkalinity and the addition of the requisite minerals to keep the pH stabilized at a high enough level. Freshwater fish usually prefer water with fewer minerals and lower pH. However, even established freshwater tanks need some buffering capacity (dissolved mineral content) to remain in the safe (though acidic) pH range. A pH below about 5.5 can kill the beneficial bacteria in the tank and destroy the biological filtering process. This leads to high levels of ammonia which eventually kill the fish. The toxicity of any ammonia in your tank is also directly affected by the pH of the water. Water which has an acidic pH (below 7.0) will have little TOXIC ammonia (although ammonia is actually present). Water whose pH is alkaline (over 7.0) will immediately turn benign ammonia into TOXIC ammonia with potentially lethal consequences. Regular testing of your tanks pH and hardness will allow you to detect and correct problems before your fish are adversely affected. Freshwater environments are usually buffered to a pH of between 6.5 and 8.0. South American cichlids and most tropicals like a more acidic tank -- 6.5-7.0. 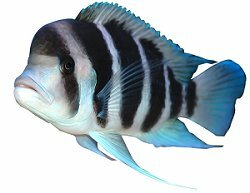 Some african cichlids and mollies like a pH that is more alkaline -- in the 8.0-8.3 range. In marine tanks, do not allow alkalinity to go below 8 and don't exceed 12. This will provide proper pH stability, and still not cause heavy precipitation of important minerals, such as calcium and strontium. Reef tanks require a pH of 8.0 to 8.3, and an alkalinity of 2.9 to 4.0 meq/L (8 to 11 dKH) is recommended, with 3.4 meq/L (9.5 dKH) being optimum. Fish-only marine tanks should maintain pH of 8.0 to 8.3 and an alkalinity 3.5 to 4.5 meq/L (or 10 to 12 dKH).